Has anyone done this? I wanna try and reupholster some dash parts but the area where the switches are makes it kinda easy to remove the knobs but all the switches have multiple wires connected to them that seem to require unplugging and I know I'm not gonna remember where to plug the wires back. Take lots of detailed, close up photos of everything before unplugging stuff. You'll be surprised how easy it is after referencing the pics. I like that panel, may have to get me one. Actually, I did that but don't feel confident in it. I can only move the panel out so far from the dash with all the wires attached. Gonna head over to the bus and take another look. I re-arranged the switches on our bus since they were scattered all over the board. It was a pain removing the switches from the individual panels. There are two clips you have press in on the back side while pushing it through. When two switches are next to each other it's real tight. There probably is a better tool to use I ended up using a paint can pry tool and some small jewelers screwdrivers. I broke some of the tabs off the switch blanks as you can see in this picture, but even with 2 tabs, at least they stay in place. As for the wiring, as noted before, take pictures. I also tried to work on one switch at a time and then re-connected the wiring once I removed the switch. There is a spring clip on each end of the switch, they just push in and snap into place. You can carefully pry them out. No need to undo any wires at all. In your 2nd pic you can see the back of the switch, half has writing printed on and the front is solid black. The switch comes apart there. 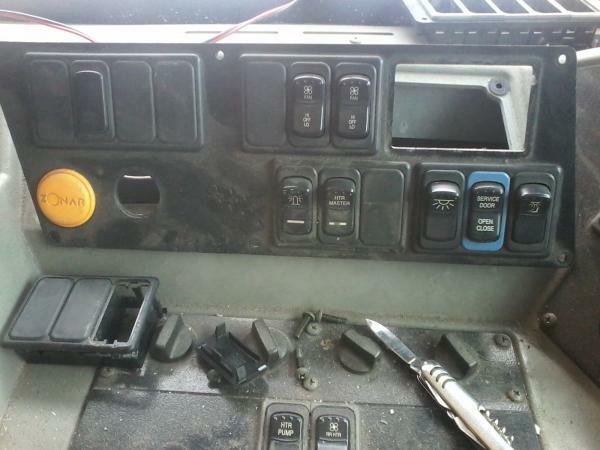 Pull your switch out of the front of the dash, disconnect the switch, reinstall switch on back side of panel. Repeat for each switch. Remove dash, reupholster, reverse this sequence. Your switch is slightly different than mine, they don't just unplug, you have to release the praying mantis looking lock on top of your switch to release the switch. Do not apply too much torque with the screw driver. The switches and the flanges that hold them in are plastic. They can all be removed by hand without the use of tools. It may take a little practice to grip the flanges in the right spot (real close to the top of the switch) and squeeze while pushing the the switch out of the panel. I have big hands (not extremely thick ones) and can manage to get them out fine.